10 metre line: Two 10 metre lines are marked on the field of play, which are situated 10 metres either side of the halfway line. When a team kicks off, the ball must cross this line for play to continue, in other words, the ball must be kicked at least 10 metres towards the opposing team to allow play to start. If the ball does not travel 10 metres, a scrum is formed in the middle of the field, with the non-offending team getting the scrum feed or put-in. 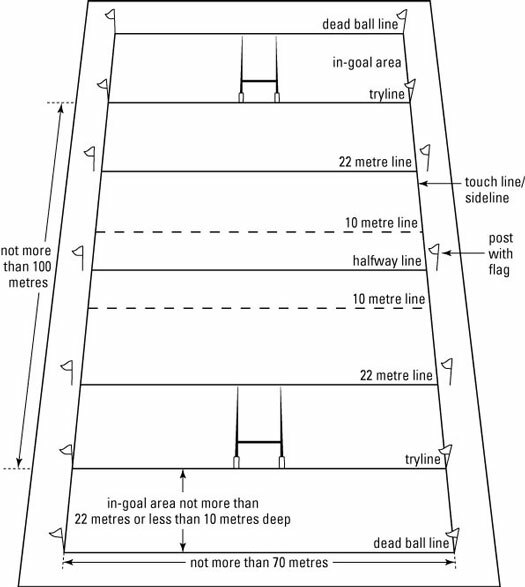 22 metre line: The field of play has two lines 22 metres out from each tryline. Goal kickers attempt to take conversions near these lines. Dead ball line: The line beyond the in-goal area at each end of the field is called the dead ball line. Once the ball goes over this line it is out of play. Halfway line: The halfway line marks the centre of the field and is where the game starts. The game is also restarted at the halfway line after successful tries or penalty goals. Sideline: The two lines marked along the length of the field are called the sidelines. A ball is described as going into touch when it crosses either sideline and goes out of the field of play. The sideline is also called the touch line. Touch line: The touch line is the same line as the sideline. Goal-line (Tryline): The line at either end of the field of play which a player must cross for his team to successfully score a try is called a tryline. The field of play: The area that is in the centre of the ground is the field of play, which measures no more than 100 metres long by no more than 70 metres wide. The playing area: Encompassing the in-goal areas as well as the field of play is the playing area. The playing area is defined by posts flying flags; the posts are at least 1.2 metres in height. The in-goal areas: At each end of the playing area are the in-goal areas, which must be between 10 and 22 metres in length and 70 metres in width. 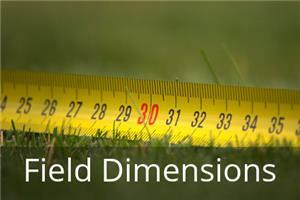 Click on following link for a Rugby Pitch image: Rugby Field Dimensions. 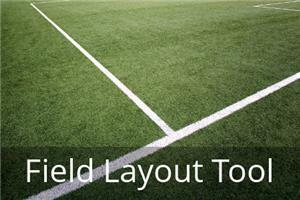 Download our fast and accurate Rugby Field Layout Tool to help strip your fields. This simple MS Excel spreadsheet takes the guess work out of creating a uniform Rugby field/pitch no matter the size requirements. The TruMark Rugby Field Layout Tool is designed for Rugby organizations and field striping personnel needing a simple yet accurate tool to help in laying out and striping their sports fields. No matter what your requirements you can generate symmetric dimensions for any age group or space restrictions. The desktop tool uses the MS Excel spreadsheet application with functions that generate staking locations based on user supplied dimensions (in meters) and the center line of the field through the center point, the goal lines, and end lines. 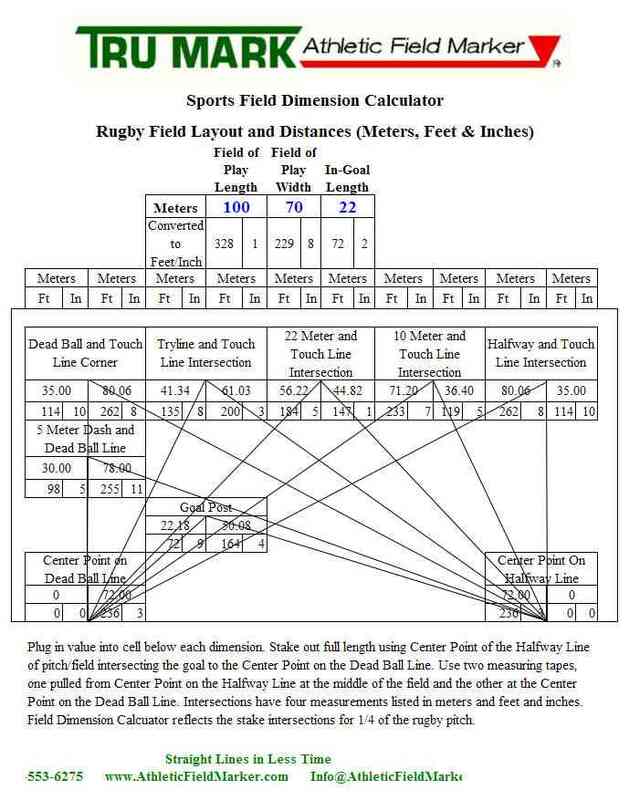 The spreadsheet layout tool allows the user to plug in a value (in meters) into a cell below each listed rugby field dimension. The orientation of the layout tool is based on staking out the full length of field down the center line of the field intersecting the goal posts to the dead ball line. The actual field staking procedure requires the use of two measuring tapes. One tape is staked or held at the Center Line Point at the middle of the Halfway Line and pulled to the associated intersection points. The other tape is staked or held at the Center Point on the Dead Ball Line (behind the goal posts). The layout tool calculates the intersections for the two tape measurements listed in both meters and feet and inches. The Rugby Layout Tool reflects the stake intersections for 1/4 of the rigby pitch (upper left quadrant when looking at a field with goal posts left to right).